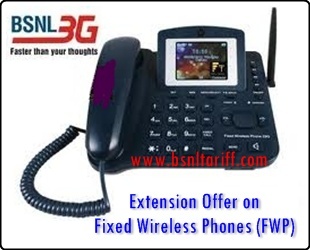 Most-Trusted-Telecom Brand and Public Sector Unit Bharat Sanchar Nigam Limited (BSN) announced to extend promotional offer on GSM based Fixed Wireless Phones (FWP) for limited period. The above extension offer will be applicable across Tamilnadu Telecom Circle (Including Chennai Telephone District). Existing plan validity of one year with General plans will continue to be available and SIM Cost Rs.20/- is to be charged. Existing Plan Voucher allowed are RS.175/- (General Neo), Rs.42/- (Second Neo Plan) and Rs.37/- (Minute Plan). Free Talk Value of Rs.125/- per moth allowed for a month is to be utilized within the month for which it is allowed and no carry forward will be permitted. Existing Validity extension/Topup conditions as per the chosen plan voucher shall be applicable and there is no change. All other terms and conditions will remain the same including the activation procedure.